I’ve been asked by many players what my strategy is when I get a big lead in a tournament. Well my advice is to not change your strategy early in a tournament just because you have a big stack. 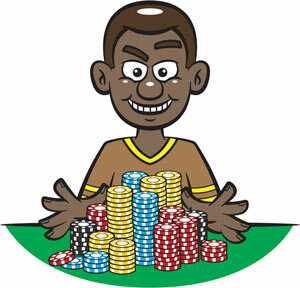 There is not too much to be gained at this stage by wielding your powerful weapon that is lots and lots of chips. This power is most useful in the mid to late stages of a tournament, when the blinds and antes are much bigger and you can put players under a lot more pressure by utilising your bigger stack to intimidate them. In the early stages there are not really any large pots to pick up uncontested. My strategy with a big stack in the early stages of a tournament is as per normal and to play only very strong hands like AA, KK, QQ, AK. I expand that a bit by including AQ, Ax suited and JJ and some speculative hands but only from the button or cutoff position. I might also call with mid to high pairs and fold to any raise. Except for the Ax suited I play these hands very aggressively. If I hit the flop I’m betting at least the pot. I don’t want to take any chances with chasers or someone with a lesser hand sucking out. Chances are most of the time the other player(s) in the hand will not want to risk getting in a big pot at this point, mainly because they could find themselves on the rail if they are wrong or get no luck. I used to play a lot more liberally when I doubled up early or got a big chip lead. Sometimes it worked but I found a greater % of the time I was getting into pots I had no business being in. It was not a good feeling because I was putting a lot of chips at risk in situations that didn’t favour me, and I knew it. So really, the way I play with a big stack is no different to the way I play usually. I will be folding most of the time and picking my spots for aggression. Hey I have more than a comfortable lead and can afford to let the others slug it out with suspect hands or take risks that you shouldn’t take. I might try to steal a blind or two to at least maintain my stack but now you just have to be patient and wait for the blinds to get higher. Let me tell you about a situation that shows just that. Early in a tournament and I had enjoyed a nice run of cards and had doubled up multiple times to a chip stack of 5,000. Most other players at my table were sitting with between 600 and 1,500 chips with one player slightly higher at 2,500 chips. I lost a bit of my stack to the player with 2,500 chips. I had raised from the cutoff seat with 9-9. He immediately went all in and I folded. I soon learned that this player was a gambler … but I wasn’t so I didn’t take a risk he had one or two over cards and could easily get lucky if I went into battle weak. He actually played the chip bully roll for the next couple of orbits and I was quite happy to let him. He even raised my blinds several times. Maybe in the old days I would to play back at players like this when I was ahead. I took it personally. Now I fold and wait for my chance … and it came. The cutoff and button fold to me in the small blind and I have 7-7. I just called and the chip bully still with less chips than me checks in the big blind. When you have a big lead continue to play solid ABC poker. I wouldn’t take a chance on hands you might normally play in the early stages to build your stack. Keep the same principles with your speculative hand like suited connectors and small pairs and don’t waste your hard earned lead by chasing cards and gifting them away. Be patient … play like you have the lead.